Blogging has taken the social media environment by storm over the last few years. What started as a platform for personal passion has turned into a widespread network of professional skills, a repository of unique information and a business proposition for many. It is no longer restricted to individuals; rather businesses have also incorporated the blogging culture in their professional network. Blogging, itself is a business idea today, which can generate revenues and create a brand for yourself. Blogging is a major source of revenue for many passionate and niche bloggers. The reach, number of views, clicks and shares also contribute a lot towards the success of a blog. For this, you need to increase your blog traffic effectively and channelize the same for generating profits and increasing brand value. You need to have your strategies right to attract both general traffics and prospects to your blog. Take a look at these 10 tips to increase the traffic to your blog. The content is the main aspect of a blog and the major differentiator too. You need to now what people want to read. So, research on trending topics and try to develop unique content on them. If you are a niche blogger, then put up posts relevant to the industry because you already have a traffic from that particular sector. Moreover, try to add multimedia content in your blog post like images, videos, infographic, etc. Recent studies have shown that people who use infographic in their posts are likely to get 12% more traffic than others, and 60% of visitors prefer to watch a video, before they read a text. 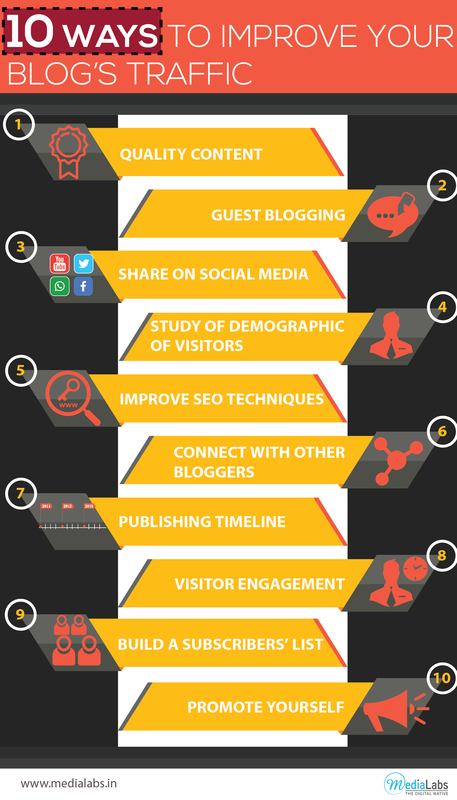 So, find ways to enhance the visitor experience with quality and attractive content. This is a concept, which can increase your network and reach, considerably. Either, you can write posts for other bloggers in the same or different niche, and your blog gets publicized through them. Or, you can also invite other bloggers or influencers to write guest posts on your blog. This is a mutual sharing promotional proposition, which is beneficial to both and adds to your credibility and visibility. Share your blog and posts as much as you can on different social media platforms. Today, everyone is on social media and it is also a business and professional network. Studies show that 31% of referral traffic come from social media. The more you share in your own timeline and also in relevant groups, you can penetrate a larger section of the audience, and connect with them to build your own network. Try different analytics softwares like Google Analytics or others, which gives you an analysis of the visitors in terms of age groups, gender, location and posts visited, etc. This will help you to post relevant content towards different types of audience, who visit your blog to increase the traffic. You should use good SEO techniques to optimize your blog. These help in greater reach, and better audience, who are really interested in your blog. It also helps you to reach the right audience, who wants to read about topics on which you have written. These tactics are really helpful in channelizing the right traffic to your blog. Apart from guest blogging, you also need to connect with fellow bloggers through your blog to channelize more traffic to your own blog. So, follow other blogs and get them to follow yours. Like and share their blogs and they will do the same for you. Look for ways to convert their followers to yours too. You can also meet up with them to organize blogging events, where you can meet new people and network. Make a feasible and a proper publishing schedule for your blog. Post regularly, but relevant posts. Do not give a big time gap between posts. However, do not keep posting a lot on a single day as it will saturate information for your followers. Maintain and stick to the timeline and plan and organize things beforehand. To make visitors come back to your blog, you need to give them a unique experience the first time. Apart from quality content, you can also have an engagement plan in place so that you get to interact with the visitors. Respond to their comments and likes. Make sharing easy, navigation user-friendly, and put an interesting action item at the end of the blog. This way they would love to come back to your back, both for the content and the experience. Make a subscriber list for your blog so that you know who is intesterst and in what. Make content downloadable as PDF or other user-friendly formats, so that they can share it with your links. A subscriber list also helps to keep your visitors informed about new posts, updates, and offers. You can also send them a periodic newsletter. Your blog is your identity, so you need to incorporate everything in it, which emphasizes your brand value. So, promote it as much as you can. Get yourself proper business cards with your blog link and share it with people of relevance. You never know whom you will meet in an event or a workshop, which can be a value add to your blog. So, promote yourself with branded products and reach out to a larger audience. In an environment, which is already infested with blogs from different genre, it is quite difficult to establish your blog. However, it is not impossible. You need to give time, allow your strategies to reap benefits and improve your blog according to analytics. The above tips will surely help you increase the traffic to your blog and help you to enhance your brand value.